Leprosy. For many, a cloud of mystery, fear and shame surrounds this disease. It’s a disease that destroys nerves and deadens limbs to sensations of touch or pain, yet at the same time can trigger bouts of unbearable agony for the sufferer as infection exposes raw bones. It’s a disease that is difficult to contract, yet carries a stigma so strong that leprosy-affected people have been forced into isolation for centuries. Why is this disease so feared, and how can we help those who contract it? Leprosy, otherwise known as Hansen’s Disease, is an infectious disease caused by a bacteria called Mycobacterium leprae. This chronic nervous system disease “mainly affects the skin, the peripheral nerves, mucosal surfaces of the upper respiratory tract and the eyes,” according to the World Health Organization1. The first symptoms of leprosy are often eye damage, painless ulcers or patches of discolored skin with accompanying numbness in the affected area. Without intervention, leprosy may cause crippling of hands and feet, loss of limbs, tissue loss on the face and blindness. The bacteria slowly attacks the nerves and will leave the one affected without the ability to detect pain. Their hands and feet will no longer notice the hot pot burning their palms, the sharp object penetrating their skin, or even a dislocated ankle as they go about their daily life. Wounds become infected, and tissue loss, degeneration or even amputation follows. The physical disfigurement caused by leprosy is one of the most well-known signs of the disease. The physical disfigurement caused by leprosy creates a physical and emotional barrier between the individual and the rest of society, the United Nations2 explains. Hansen’s Disease, as we know it, has mutilated lives for thousands of years. Reports of leprosy go back as far as 600 BC.3 In the Old and New Testament, the Israelites received instructions from God to remove leprosy from among their camp; and later, Jesus Himself touches and heals many people afflicted with leprosy. Are there any differences between modern-day leprosy and the mentions of leprosy in the Bible? Many have believed the disease is the result of some great sin of the victim. It is likely that the man with a withered hand in Mark 3:1–5 suffered from the leprosy we are discussing today. Cultures around the world have recorded the devastating effects of Hansen’s Disease: disfigured noses and facial tissue, blind eyes, missing fingers or toes, and hearts rent in grief and anguish. Intensifying the trauma of the disease is the weight of guilt many sufferers carry. Over the centuries, many have believed the disease is the result of some great sin of the victim. Instead of kindness or pity, the human being—whose world has just shattered—receives a cold shoulder; a fearful stare; an invitation to hit the road, move to a “leper colony” and leave the life they knew before. For hundreds of years, even medical professionals responded in fear of the infectious disease. Because of the misunderstandings and stigma associated with leprosy, very few people in history chose to study the bacterial infection. The few who did confront it now have millions of people benefitting from their courageous efforts. 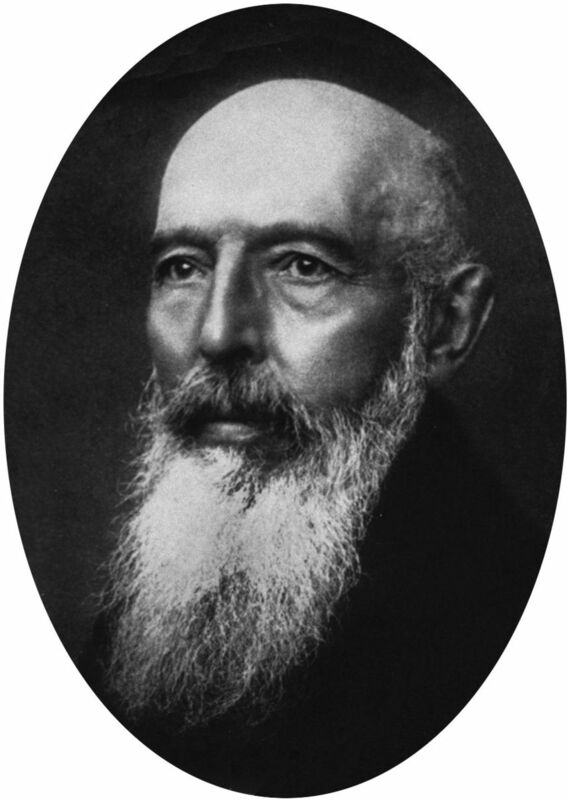 In 1873, when people believed leprosy was the result of a curse or a judgement from the gods, Dr. A. Hansen, a physician from Norway, discovered that leprosy was caused by bacteria. He proved it was a contagious disease, like so many other plagues in our world. And when you find the cause of a disease, there is hope of finding a cure. After that, a few remedies were found to treat leprosy patients, but the disease and its progression remained widely unknown and unexplored until the 1940s. At that time, new anti-leprosy drugs called sulfones were used to treat patients of Hansen’s Disease, but after the bacteria was eliminated from the person’s system, the disfigurement remained—and the discrimination. 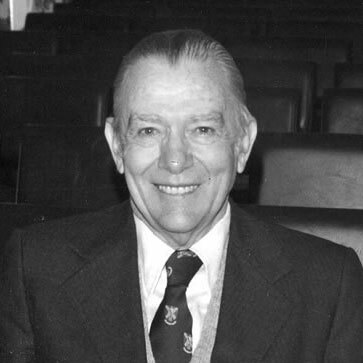 In 1947, a world-renowned orthopedic surgeon working in India, Dr. Paul Brand, visited a leprosarium. Dr. Brand was appalled to uncover the lack of research performed regarding the physical deformation leprosy causes. In his book The Gift of Pain, coauthored with best-selling writer Philip Yancey, Dr. Brand records a conversation he had with a pioneer leprosy specialist, Dr. Bob Cochrane, at a leprosy sanitarium. Dr. Brand learned from Dr. Cochrane that, although leprosy was crippling more people than polio or any other disease, few physicians had investigated the disease, and no orthopedist had researched leprosy and the disfigurement it produces. Most doctors at that time joined society in thinking leprosy was a curse from the gods, and as such, it was not a disease they paid attention to. That conversation and many future encounters with leprosy patients spurred Dr. Brand to delve into the disease and to later become a leprosy specialist himself, establishing breakthrough techniques for correcting leprosy disfigurement. Although most in the medical field steered clear of leprosy for hundreds and even thousands of years, some dedicated men and women throughout history have labored to understand leprosy. As a result, today leprosy is curable. Over the decades following Dr. Hansen’s discovery in the 1870s, multiple treatments were used, but they achieved varied success and leprosy bacteria began developing an immunity to the sulfone drug therapy. Finally, in the 1980s, a multi-drug therapy (MDT) treatment successfully cured leprosy without the threat of bacteria developing an immunity, and WHO adopted it as the standard leprosy treatment. With this powerful cure, multiple global leprosy-elimination strategies have been implemented and have made great strides in reducing new leprosy cases. With support from groups such as the Nippon Foundation, Novartis Foundation and others, MDT has been globally available since 1995—free of charge. Yet in 2015, more than 200,000 people discovered they had leprosy—a disease that not only ravages the body but also tears families and communities apart. Now that we have a cure for leprosy, why then, does this devastating disease still exist in our world? Yohei Sasakawa, the WHO ambassador for leprosy elimination and the chairman of the Nippon Foundation, gives the answer to this question. It is the stigma and misunderstanding surrounding leprosy that causes the disease to still ravage lives today. Eliminating discrimination and false conceptions of leprosy is key to eliminating the disease itself. Gospel for Asia’s field correspondents have interviewed many leprosy patients over the years. Each person’s account is unique, but there are common elements: shame or fear hindering them from seeking medical attention; believing treatment is too costly; and excommunication from family or friends when it becomes known they contracted leprosy. Even the children of leprosy patients are spurned from society. Precious stories of faithful husbands standing by their leprosy-affected wives5 shine like beacons in a bleak sea of sorrowful testimonies. When leprosy was discovered in Kishori’s body, her community endangered her marriage. Kishori’s husband stood by her faithfully, never heeding their community’s call to abandon her because of her leprosy. Stories like Kishori’s reveal the strength of ingrained stigma—but also how love can withstand those pressures. Sadly, more frequent are the stories of men and women abandoned by their spouses, in-laws, or even kicked out of their homes by their children. Once on their own, men, women and even children of all ages often gather together in leprosy colonies. There, at least, they are understood by their neighbors who suffer from the same affliction. In these leprosy colonies, governments often organize relief and medical work for patients. Yet many find the monthly ration too meager to live on, and they must do whatever they can to keep themselves and any family members with them alive. Cultural stigma and misunderstanding oftentimes force leprosy sufferers to live in a community by themselves. Here again, stigma bars their way. Dr. 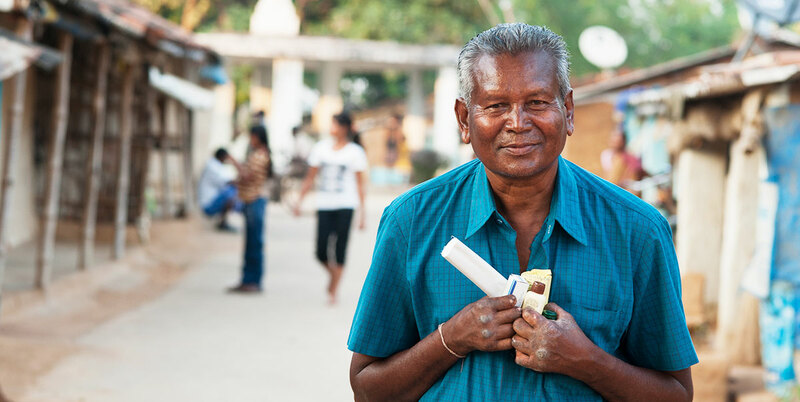 Brand shares in The Gift of Pain the story of Sadan, a leprosy patient whom his wife met. Leprosy had first appeared on Sadan’s body when he was only 8 years old. The stigma of his disease meant he was expelled from school and isolated from society. The child’s friends avoided him, even crossing the street to keep from encountering Sadan. Finally, when he was 16 years old, Sadan managed to attend a mission school, but his education couldn’t cover up his disease. Employers turned him down, and restaurants and stores would have nothing to do with him. Even public transportation was denied him. The deformed hands of leprosy patients—and the stigma that surrounds the disease—limit job opportunities. Many unheard stories follow a pattern similar to Sadan’s. The jobs available to leprosy patients are few, and their damaged hands and feet limit them even more. Some may be able to open shops within their colony—few patients dare to venture out to public markets for fear of disturbing other customers or shop owners with their presence—while others turn to begging, utilizing the very deformities that trapped them in such desperation. Pervasive fear of catching leprosy permeates the minds of those around leprosy patients, but the reality is that 95 percent of people are naturally immune to leprosy.7 Only those who lack this inborn immunity can contract the disease. Research has made great strides in learning about leprosy, but how leprosy is transmitted from person to person is still largely unknown. Those who develop leprosy are typically people who have been closely exposed to Hansen’s Disease for an extended period of time, such as children—who appear to be especially vulnerable. Yet with even one dose of MDT, leprosy patients are no longer contagious, according to American Leprosy Missions.8 Depending on which of the types of leprosy they contracted, they can be cured with six to twelve months of proper treatment9. "A leprosy campaign can be likened to a motorcycle," Sasakawa says. "The front wheel is the medical cure, and the rear wheel is the elimination of stigma and discrimination. The motorcycle will not run smoothly unless the two wheels are balanced and moving at the same speed." The key is catching leprosy early enough to avoid the debilitation of leprosy as it runs its course—and to prevent the patient from transmitting it to anyone else. Yet beyond the fear of rejection, there is another force at play hindering patients from seeking help: an unwarranted sense of guilt. 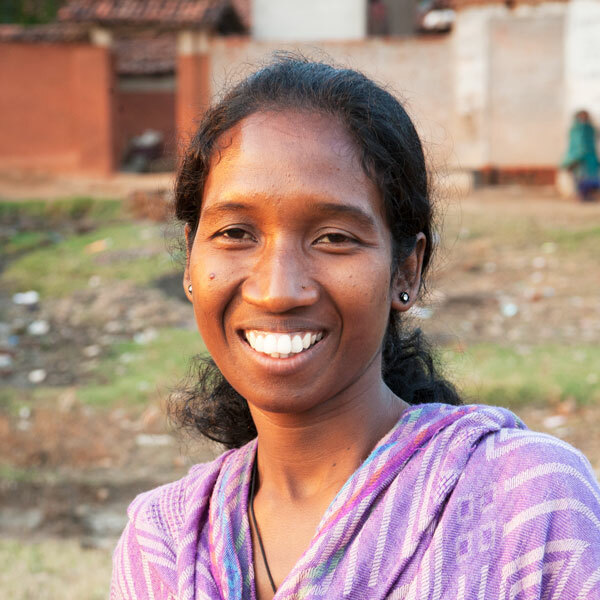 Sakshi, who ministered to leprosy patients, once had leprosy herself before Jesus healed her. “Don’t open my bandage!” the leprosy patient cried out. For years the patient believed it was because of their sin that the destructive disease controlled their body. Now, they thought they must suffer and settle with bearing it alone. 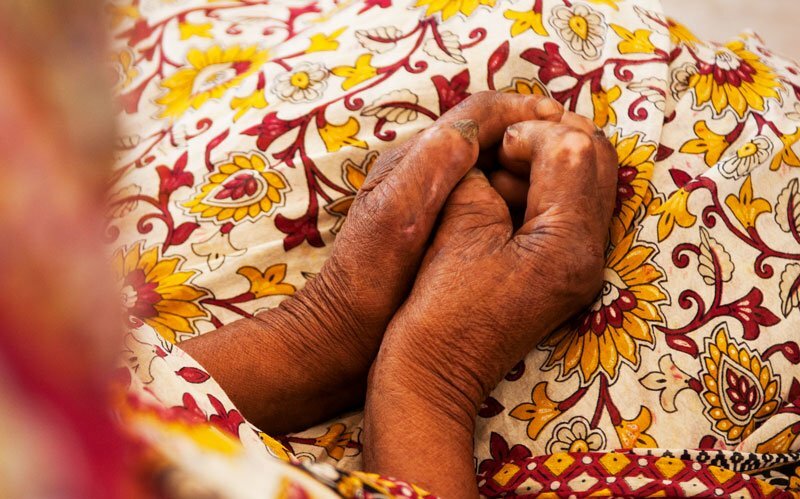 But after the leprosy patient’s exclamation, Sakshi, a GFA-supported missionary, revealed her own hands and feet to the patient, deformity clearly marking what leprosy’s nerve killing illness left behind. This conversation, shared by GFA in 201711, gives a glimpse into the despair and belief of personal guilt many leprosy patients carry. Sakshi understood only too well the shame and grief of those she served. Leprosy was detected in her body when she was only a teenager. Dreams of living life as a normal young woman shattered with that diagnosis. Her disease barred her from visiting her neighbors or from making friends, and it even estranged her younger siblings. “[My brother and sister] used to love me so much, but when I got this sickness, they were hating me, and they don’t want to come to me for anything,” Sakshi recalls of her early days as a leprosy patient. Acceptance and kind words from her community were replaced with rejection and accusations. People said it was her fault she contracted leprosy, and over time, that lie took hold of her heart. Guilt and hopelessness consumed her, and she began wondering why she should endure life. In her hopelessness, Sakshi tied a noose to hang herself. Although Sakshi’s story does not end here, many leprosy patients’ stories end on a tragic note of despair. Whether they choose to end their lives or plod through the rest of their days alone and abandoned, the moment they discover leprosy in their body is the moment society defines them by their disease—not by their value as human beings. In 2007, GFA World-supported workers began ministering among leprosy patients with an aim to change that definition. And so, Reaching Friends Ministry began. What started in 2007 as a handful of men and women pursuing opportunities to care for outcasts of society has since expanded to minster to patients in 44 leprosy colonies. Each colony is home to as many as 5,000 patients. Through this ministry, thousands of hurting hearts have found a glimmer of love and hope to cling to. Let us call them "friends" because they have been created in the image of God, like us. Sakshi’s testimony proves the impact of even one kind word in the midst of isolation. Although Sakshi planned to end her life, today her story continues. On that pivotal day, her father saved her from suicide and spoke words of life into her weary soul. He told Sakshi she was a precious child and urged her to strengthen her heart through the pain and hardship. Sakshi's feet still bear the marks of leprosy, though she is now cured. After the conversation with her father, Sakshi gave up trying to end her own life, but she still felt alone and worried. Leprosy still disfigured her limbs and even threatened to remove one of her legs to amputation. But then she met some GFA-supported missionaries who prayed for her and shared with her about the Great Healer. She joined them in faith and asked Jesus to heal her body. God moved on her behalf; she was miraculously healed of leprosy! Like Sakshi, many leprosy patients are discovering that physical healing—through both prayer and medical treatment—is possible. Now, it is time for communities around the globe to be healed of the negative mindset toward those with leprosy. 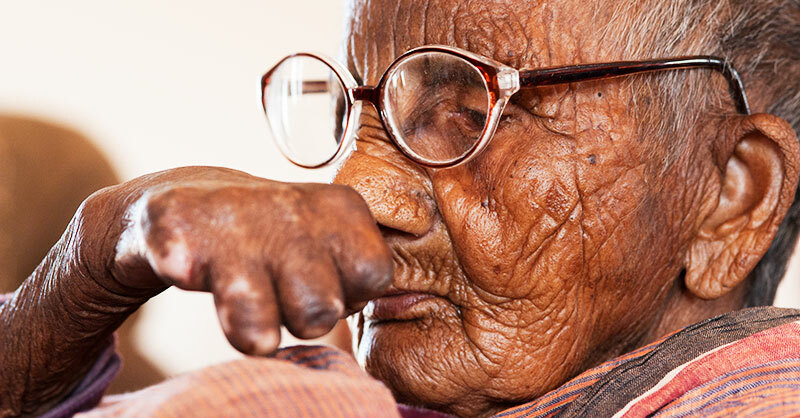 Over the passing of time, leprosy has drawn increased attention around the globe. 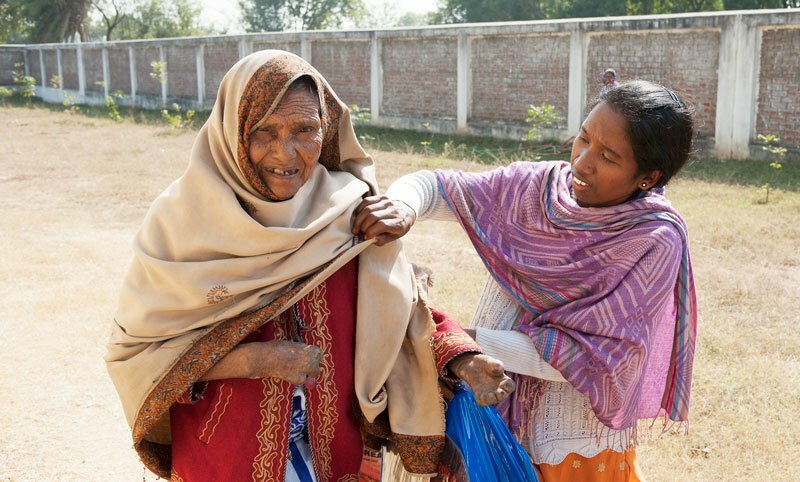 The last Sunday in January has been observed as World Leprosy Day for more than 60 years. But while most countries have been freed from the grip of leprosy as a result of leprosy elimination programs, other areas are still high in battle against the disease. Brazil, India and Indonesia account for more than 80 percent of new cases detected globally12, and areas of Africa also detect leprosy in high numbers. The transmission of leprosy is slowly decreasing, but more must be done, especially regarding the elimination of stigma. The transmission of leprosy is slowly decreasing, but more must be done, especially regarding the elimination of stigma. In 2016, The World Health Organization launched their new Global Leprosy Strategy . Included among the increased effort to detect and care for new patients is a high emphasis on the removal of stigma and discrimination toward those with leprosy. 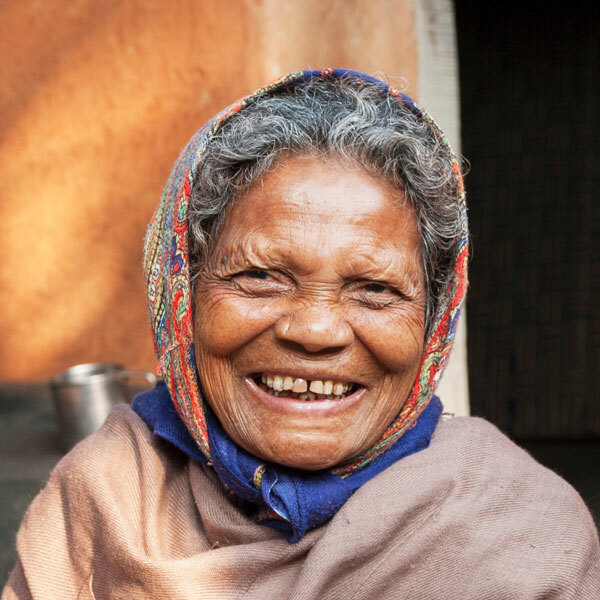 GFA World wholeheartedly desires to see the plight of leprosy patients improve, and its work in Asia is helping make strides in both the emotional and physical healing of those affected by leprosy. Sisters of Compassion are specially trained to minister to the hurting, rejected and downtrodden of society—ministering to both their physical and spiritual needs in the name of Christ. 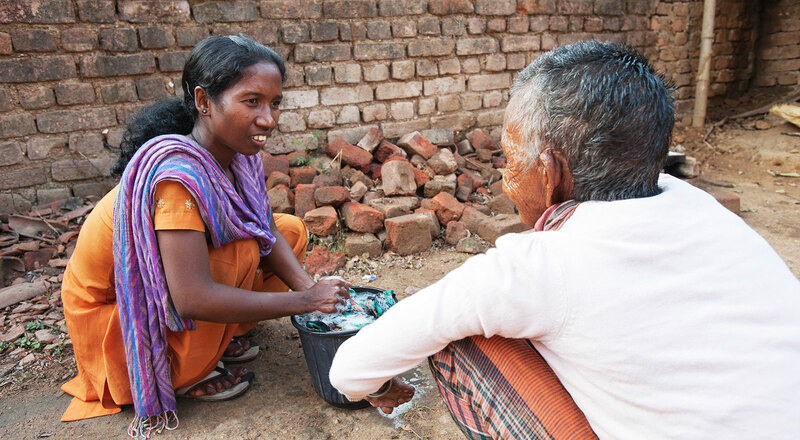 While you’ve been reading this article, national workers, including around 500 specially trained women called Sisters of Compassion, are helping care for leprosy patients throughout the Indian Subcontinent as part of GFA-supported leprosy ministry. Sakshi herself became one of those faithful workers. After she experienced God’s healing, she dedicated her life to serving Him and enrolled in a training course. Her passion for ministry among leprosy patients soon placed her alongside other GFA-supported workers serving in a leprosy colony. Through GFA-supported Reaching Friends Ministry, she became part of bringing hope to others still trapped in the desperation she felt when she held the rope in her hand. She and other servants of God serve these precious patients in practical ways, such as by cleaning wounds, doing housework, cooking meals and helping with personal hygiene. Through every sweep of a broom and touch of their loving, helpful hands, these workers convey how much God values His creation—even those abandoned by their own families. Through love like Sakshi’s, many leprosy patients are finding new hope and lasting joy that helps carry them through their troubles. K.P. Yohannan, founder of GFA World,14 wrote about his experience of witnessing leprosy ministry take place. 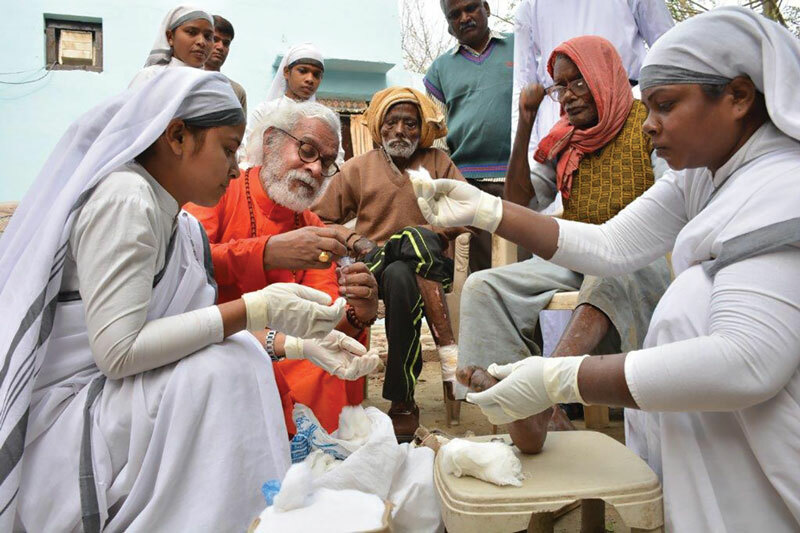 Gospel for Asia founder KP Yohannan worked alongside Sisters of Compassion to clean the wounds of leprosy patients during a recent trip in November 2017. These workers, like Sakshi, are diligently bestowing love, medical care, assistance and dignity to those suffering with Hansen’s Disease. Some specialize in making customized shoes for leprosy patients, carefully measuring each individual’s feet to accommodate the sores or disfigurement the person has experienced. Other workers make warm meals for those who cannot cook—or even eat—by themselves; clean homes; wash and comb the tangled hair for those who can no longer perform even these most basic functions for themselves. GFA-supported workers minister in whatever way is needed—here, a Sister of Compassion cleans a leprosy patient's wounds, and a man makes custom shoes for leprosy patients. Workers serving at a GFA-supported leprosy hospital offer tender care for patients afflicted with Hansen’s Disease. Beyond addressing the physical needs of medication, procedures and bandages, this hospital gives its patients emotional support, acceptance, respect and genuine concern for their holistic wellbeing. Hospital staff members routinely visit neighboring leprosy colonies to examine patients and determine who should go to the hospital for medication or treatment. They also host events to increase awareness of basic health and hygiene practices, as well as speak words of truth and life to those who feel overcome by their sorrowful plight. "Jesus Himself touched [those with leprosy] and healed them... Jesus told us to go and do the works that He did." “Leprosy Elimination.” World Health Organization. http://www.who.int/lep/disease/en/. 22 January 2019. “Changing the global face of leprosy.” United Nations Department of Economic and Social Affairs. http://www.un.org/en/development/desa/newsletter/desanews/dialogue/2015/06/14764.html. 1 June 2015. “Leprosy: Fact Sheet.” World Health Organization Regional Office for South-East Asia. http://www.searo.who.int/entity/leprosy/topics/fact_sheet/en/. 22 January 2019. Gillen, Dr. Alan L. “Biblical Leprosy: Shedding Light on the Disease that Shuns.” Answers Magazine. https://answersingenesis.org/biology/disease/biblical-leprosy-shedding-light-on-the-disease-that-shuns/. 10 June 2007. “Healing for the Sores on Her Soul.” GFA. https://www.gfa.org/news/articles/healing-for-the-sores-on-her-soul/. January 2015. The World Bank. Document of The World Bank Report No: 21751, The World Bank, 27 Feb. 2001, pg. 17, http://documents.worldbank.org/curated/en/894271468774894671/pdf/multi0page.pdf. “National Hansen's Disease (Leprosy) Program Caring and Curing Since 1894.” Health Resources and Services Administration. 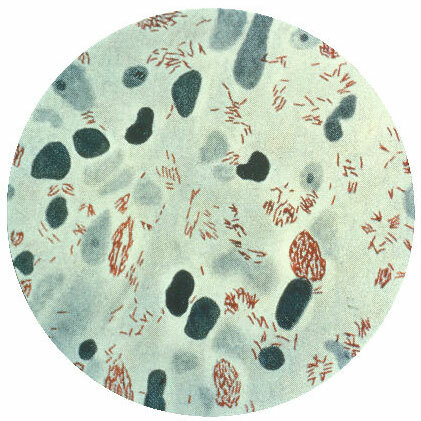 https://www.hrsa.gov/hansens-disease/index.html. 22 January 2019. Leprosy Frequently Asked Questions. American Leprosy Missions. https://www.leprosy.org/leprosy-faqs/. 22 January 2019. Singh, Dr. Poonam Khetrapal. “Scale up efforts against leprosy; focus on preventing disabilities in children.” http://www.searo.who.int/mediacentre/features/2017/scale-up-efforts-against-leprosy-prevent-disabilities/en/. 22 January 2019. “I Will Be Their Daughter.” GFA. https://www.gfa.org/news/articles/i-will-be-their-daughter/. January 2017. “What is Leprosy.” Uniting to Combat Neglected Tropical Diseases http://www.unitingtocombatntds.org/ntds/leprosy/. 22 January 2019.
WHO SEARO/Department of Control of Neglected Tropical Diseases. “Global Leprosy Strategy 2016−2020: Accelerating towards a leprosy-Free world.” Leprosy elimination, World Health Organization, Aug. 2016, http://www.who.int/lep/resources/9789290225096/en/. Yohannan, Dr. K.P. “Which One of My Babies Must I Let Die?” http://www.patheos.com/blogs/kpyohannan/2017/12/one-babies-must-let-die-kp-yohannan/. 20 December 2017. “Teams Distribute Food, Shoes, Supplies to Afflicted on World Leprosy Day.” GFA. https://www.gfa.org/pr/teams-distribute-food-shoes-supplies-afflicted-world-leprosy-day/. 21 February 2017.